"Beyond The Battlefield" is a 10-part series exploring the challenges that severely wounded veterans of Iraq and Afghanistan face after they return home, as well as what those struggles mean for those close to them. Learn how you can help here. Other stories in the series can be found here. Listen to reporter David Wood discuss "Beyond The Battlefield" with NPR's Terry Gross here. Wood and wounded veteran Bobby Henline will hold a live video chat this Friday. See more details and send them questions. A decade of fighting in Afghanistan and Iraq has left thousands of young Americans suffering with severe pain from amputated limbs, burned flesh, lacerations, shrapnel punctures and traumatic brain damage, injuries that kept them in intensive care for months or years. Yet military doctors and nurses felt they were "ill prepared" to manage their patients' pain, an Army task force reported in May 2010. The scope and ferocity of the wars caught the medical system serving the U.S. military and its veterans flat-footed. 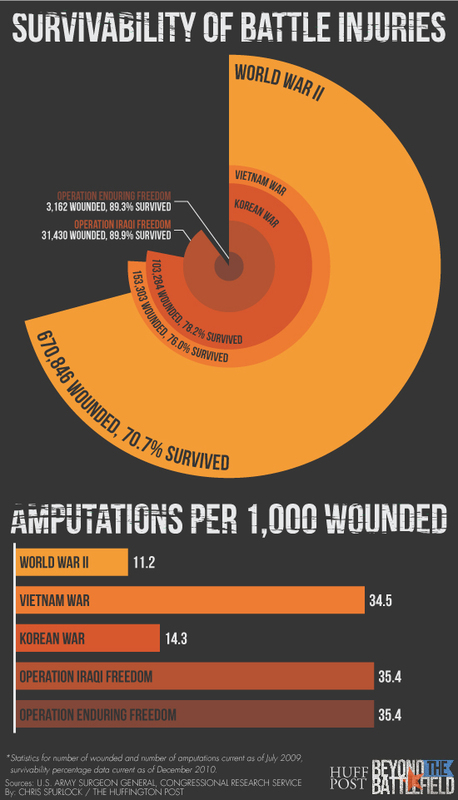 No one was ready for IEDs and the distinctive pattern of terrible wounds they would cause. No one was ready for the war to extend beyond a decade. No one was ready for the massive numbers of wounded, the severity of their wounds or the resulting strain on the broader system. "The upside is the survival rate," says Army Col. Kevin T. Galloway, chief of staff for the pain management task force study, referring to the high percentage of battlefield casualties who are being saved from near-certain death -- a dramatic increase from previous conflicts. The challenge for the medical system, he notes, is that the wounded "survive with such complex, serious injuries and pain management challenges that we didn't have to deal with in the past." Over a decade of war, the Department of Defense and the Department of Veterans Affairs have been scrambling to catch up with the care that the severely wounded need, and with some notable exceptions and scandals, they have largely succeeded. Years of hard work have produced what many regard as the best combat trauma and rehabilitation system in the world. Military medicine, under the pressure of successive waves of the severely wounded, has created breakthroughs in prosthetics, surgical techniques and regenerative medicine, among others. As a result, 16,000 or more badly wounded young Americans like Tyler Southern are coming home alive. "I just want everyone to know what wonderful people took care of him,” says Southern’s mother, Patti. “They all went above and beyond, they do such wonderful work and they are so compassionate and took such good care of all of us, not just Tyler." Yet despite all of their compassion, hard work and medical innovations, the huge bureaucracies of the Defense and Veterans Affairs departments still pose significant problems for the severely wounded. Veterans report difficulties in getting appointments, getting their disability ratings and payments, and getting access to mental health services. Wounded veterans, and especially their spouses, complain of having to spend hours and weeks on the telephone with what they view as the VA's bewildering bureaucracy. Ted Wade is a case in point. A sergeant with the 82nd Airborne, Wade fought in Afghanistan and then Iraq, where an IED struck his convoy in 2004. The blast severed his right arm above the elbow and left him in a coma with severe traumatic brain injury. When his fiancée Sarah Dent flew to the military hospital in Landstuhl, Germany, to be with him, the first issue she dealt with was whether she and the staff should simply let him die. Doctors were dubious about his chances of survival. But Sarah and Ted fought for his life, and won. Sarah says the intervening years, however, have been a nightmare. "Ted has incredible resolve and determination and has always been very motivated," she says. "But he had to learn to talk and walk again, and to continue to fight is demoralizing and exhausting." Having to fight the Defense Department and the VA as well, she said, "has been really hurtful." For instance: Ted was treated at the former Walter Reed Army Medical Center, where he received excellent orthopedic care, but no help was available there for his brain injury. Sarah found a private facility in Washington that specialized in such injuries, but the Army refused to pay for it. Instead, Ted was sent home to North Carolina for treatment at the Durham VA Medical Center. The Durham center had no experience with combat brain injuries either, so doctors put him in the geriatric ward. His roommates were veterans of World War II and Korea. It wasn't until Sarah convinced his former doctors at Walter Reed that Ted badly needed help that they arranged to have him treated at a private clinic in North Carolina, where he is still an outpatient today. But Ted still needs a close supervisor to enable him to get out and into the community, a role Sarah can't fill while trying to earn a living. "With the VA over the years, it has been a constant battle," Sarah says. "Six months after we got home they wanted to discontinue his care, the second he wasn't under the eyes of Walter Reed. It's been difficult to get them to pay for what the doctors recommended. I really had a challenge to get the VA to provide appropriate long-term care for him, a battle that continues to this day." Sarah also fought, loudly and publicly, to get the VA to train, certify and pay full-time caregivers like herself who have given up their jobs and career to take care of their severely wounded spouses or sons. When the VA balked, Congress passed legislation demanding it establish such a program, and President Barack Obama signed the bill into law in May 2010, with Sarah there to witness it. The president lauded her "passionate and very effective voice on behalf of wounded warriors and their families." It still took the VA another year before it actually put the caregiver program into action, and even now it doesn't cover the kind of long-term care and supervision that Ted and other young veterans feel they need to be active in their communities. "What I have not seen, over more than seven years, is anybody admit that there is a problem," Sarah says. Talk with combat-wounded veterans and you find a mix of high admiration for individual surgeons, therapists, nurses and other care providers -- sometimes mixed with frustration or contempt for the medical bureaucracy that constrains them. Many of the severely wounded feel that they should receive the best care available. After all, they reason, they’ve put their lives at risk serving their country and top-notch care is what most politicians promise anyway. Triple amputee Southern, a Marine corporal blown up last year by an IED in Afghanistan, says flat-out that medics, surgeons and other trauma specialists saved his life. Still, he said, life at Walter Reed, where he is in his second year of rehab,"isn't the greatest." "Overall, they take good care of us," says Bobby Henline, a former staff sergeant with the 82nd Airborne who was badly burned in an IED blast in Iraq. "They weren't ready for this many people coming in at once. We got that fixed. There's always room for improvement, but we're getting good medical care, what we need and then some." While acknowledging the strengths of the system, however, Henline is also fighting to get the VA to pay for modifying his house in San Antonio, with extra-strength air conditioning. Burn patients, he pointed out, have skin grafts that don't sweat and they have trouble controlling their body temperature. The VA pays to modify the homes of amputees for wheelchair access. Why not help out burn patients, too? Eric Shinseki, a retired general and former Army chief of staff who lost a foot in combat in Vietnam, is secretary of the Department of Veterans Affairs. He did not respond to numerous requests for an interview to discuss the VA's care of the severely wounded. But I asked the VA's undersecretary for health, who is responsible for all VA medical and mental health care, about these kinds of difficulties for wounded veterans and their families. Robert Petzel, a soft-spoken avuncular physician, told me that whatever problems veterans have encountered with VA medical care are in the past. The problems have been fixed, he asserts -- including what had been a chronic problem with VA care: losing track of patients. To counteract that problem, veterans getting VA care are now each assigned at least one case manager, Petzel says. I mentioned the difficulty that Cheryl Gansner had in getting help from the case manager assigned to her husband, former Army Staff Sgt. Bryan Gansner, badly wounded by an IED in Iraq. Cheryl had told me that their case manager was so busy with 5,000 cases that Cheryl told her not to bother trying to keep track of Bryan's traumatic brain injury treatments because she was useless. "Everybody who enters traumatic brain injury care gets intensive case management," Petzel insists. "A tremendous amount of VA assets are directed at providing case management and support. That's quite remarkable, because it's so extensive. It's not something we have done in the past." Other veterans also have had difficulty getting mental health therapists. Zac Hershley, an Air National Guardsman, came back from multiple tours in Iraq and Afghanistan with post traumatic stress disorder. The VA eventually assigned him a psychologist in private practice, several hours' drive away from his home. When Hershley showed up for his first appointment, he found his therapist wearing a traditional Middle East headscarf, the hijab. He recoiled. "I could never talk to her about what I experienced over there," he later said. "I probably killed her brother." Hershley says he eventually found a good therapist who helped, but she was transferred, and he hasn't found another therapist reasonably nearby who had the time to see him and the experience to understand his problems. While some veterans and even therapists say there are insufficient mental health resources, Petzel says that problem has been fixed. The VA alone has hired 7,500 mental health therapists since 2005, he says. "We do not have any evidence that we're not able to provide mental health services. So there isn't a shortage -- there just isn't," he says. An outside view comes from Nancy Berglass, director of the Iraq Afghanistan Deployment Impact Fund at the California Community Foundation in Los Angeles. The foundation provides grants to non-VA community-based services for veterans who often are waiting for overcrowded VA programs. Dozens of these nonprofit service organizations are filling the gaps between the growing demand of veterans for mental health services, and the ability of the VA to meet the demand. A psychologist in private practice, who treats veterans under contract to the VA, says the demand for mental health services is so great "the VA is simply overwhelmed.'' He asked not to be identified by name. VA officials, in response to criticism, like to cite surveys that they say show that most veterans are highly satisfied with VA care. "Our satisfaction rates are phenomenally high with the people who use the system," Petzel says. According to the VA, 414,761 veterans accessed VA health care during 2010. Of those, only 1,057 complaints were registered by Iraq and Afghanistan war veterans about the coordination of their care. An independent assessment of how satisfied all veterans are with VA services was recently completed by the American Customer Satisfaction Index, which measures across industry and government agencies. It found that in 2010, 85 percent of veterans treated as in-patients at VA hospitals were satisfied with their care; these veterans -- of whom only a small portion served in Iraq or Afghanistan -- rated the VA's customer service most highly, with 93 percent satisfaction. Across the civilian hospital industry the satisfaction rating was 74 percent, according to the study. "The public outside the VA, outside of people who use the VA, don't understand what we're about," Petzel says. "I think sometimes they tend to believe these things they read which we think don't actually reflect what's going on." The 9th Circuit U.S. Court of Appeals in San Francisco challenged that view in a decision that took the unprecedented step of finding that the VA, because of inadequate mental health care and other medical lapses, had violated veterans’ constitutional rights. It found the "influx of injured troops returning from deployment in Iraq and Afghanistan has placed an unprecedented strain on the VA and has overwhelmed the system..." As a consequence, the court determined, veterans were forced to endure lengthy delays for treatment, especially for mental health care. Some, it found, have committed suicide. "The VA's unchecked incompetence has gone on long enough," the court declared. "No more veterans should be compelled to agonize or perish while the government fails to perform its obligations." While Justice Department lawyers wrangle over a possible appeal, I asked Petzel, in view of the flood of complaints from veterans and families -- and the courts -- whether he and others at the VA felt misunderstood. "I guess the short answer is yes," he says. "But there's great satisfaction in knowing that we have this incredible system, particularly in terms of mental health and outreach. We know what we can do." "It would be very nice," he adds, sadly, "if there was a better understanding in some quarters of what we do." In the meantime, medical officials have tackled the problem of pain with a vengeance. An electronic database was established that tracks the pain treatments a patient has received from the battlefield to retirement. The VA adopted a new policy for patients transferring from active duty to VA care, requiring that if the VA facility doesn't have the same pain medication the patient had been receiving, he or she will get that medication while the VA figures out what to do -- rather than denying him or her the medication, as had been done until now. The Army is reorganizing the way it trains its medical personnel to deal with pain, focusing on interdisciplinary care to ensure that traumatic brain injury patients, for instance, benefit from the latest pain treatments. The Army also is working with acupuncture, aromatherapy, yoga, movement therapy, massage and other nontraditional pain treatments as they prove successful. Galloway, the chief of staff for the pain management task force study, described the Army's new work on pain management as a culture shift toward more innovative, collaborative work. "Combat accelerates this kind of change," he told me. "Weaknesses in our system have been highlighted to the max," he said, and the reforms will spread to civilian health care as well. From this experience, he said, "there's going to be long-term gains for the entire country." The struggles that the wounded and their families have with the health care systems that serve the military and its veterans likely will go on. Both systems, which manage tens of thousands of people, are inherently monolithic and bureaucratic. Both health care systems, often when scandal or Congress prods them, have moved to address glaring problems. The Pentagon invented Warrior Transition Units to keep better track of the wounded; the Marines have similar detachments. The VA has added patient care coordinators and mental health advocates. Large gaps remain, however, in the services and care the systems can provide, as the nonprofit veterans' service organizations that have grown rapidly in the past decade can attest. Taking care of the wounded "is a large problem and they need some help with it,'' Bill Lawson, president of Paralyzed Veterans of America, says of the Defense Department and the VA.
NEXT: While the military's health care system was caught flat-footed by the human costs of a decade in Afghanistan and Iraq, the U.S. government hasn't prepared for the long-term financial costs, either. Physical therapist Kyla Dunlavey works with Sgt. Ted Wade of the 82nd Airborne while his spouse Sarah Wade watches at Walter Reed Army Medical Center in Washington, D.C., September 19, 2007.